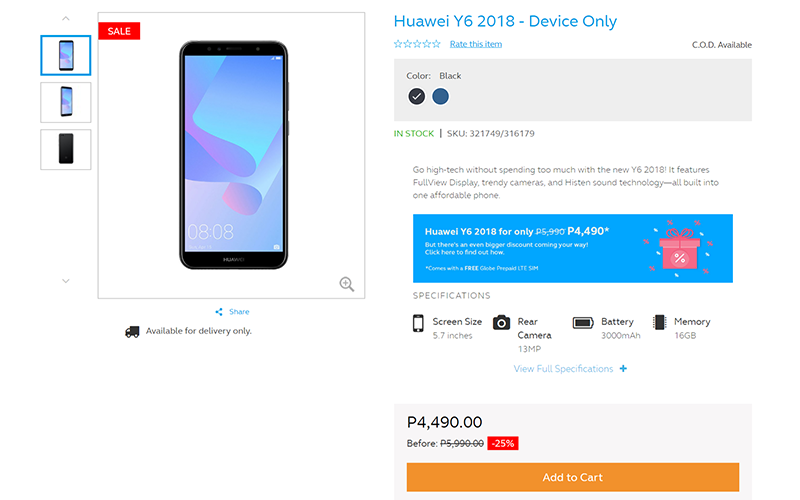 Huawei's 2018 budget smartphone, the Y6 2018 is 25 percent cheaper at Globe's online prepaid phone store. From PHP 5,990, the said device is down to just PHP 4,490. For those who missed our review, the Huawei Y6 2018 is a budget smartphone with a taller 18:9 screen aspect ratio. It boasts a 5.7-inch HD+ 2.5D curved display which is not that common at its price point. It has a Snapdragon 425 quad-core processor, 2GB RAM, 16GB expandable storage, and 3,000mAh battery. On the camera, it highlights a 13MP f/2.2 selfie camera and a 5MP f/2.2 selfie camera with screen flash and face unlock. The only downside of this is you can't use it with Smart's network. If you are a Globe user, no problem.